Significance : UNESCO World Heritage Site. The famous Mahabodhi Temple complex is located in central Bihar in Bodh Gaya, the place where Lord Buddha is believed to have attained enlightenment around 2,500 years ago. The temple lies 115 km south of the state capital of Bihar, Patna and 16 km from the district headquarters at Gaya. Bodh Gaya is one of the three places directly connected to the Buddha's life with Lumbini and Kushinagar. The Mahabodhi temple is considered a life-time destination for millions of Buddhists across the world. It is visited by millions of tourists and pilgrims annually from all over the world, especially from Sri Lanka, China, Japan and the southeast Asian region. In the year 2002, the UNESCO declared the 1,500-year-old Mahabodhi temple as a World Heritage Site. The Bodhi Tress is located in the temple complex. 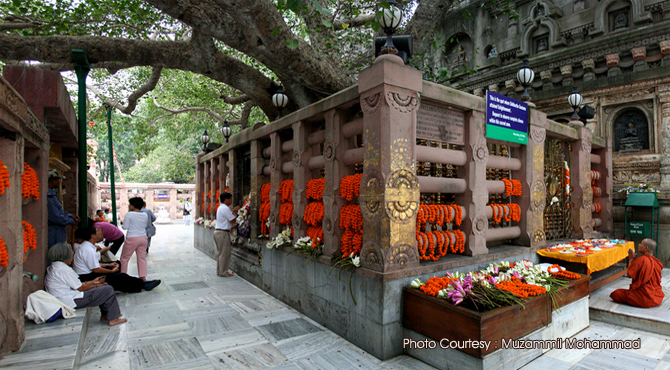 Historically, the shrine was known as the Bodhimanda - or the site of the Bodhi tree. It was named Bodh Gaya in the 18th century. The temple has been restored and rebuilt over the centuries. Originally a shrine erected by Emperor Ashoka near the Bodhi tree, it was later replaced by the Mahabodhi temple in the 2nd century. The temple was rebuilt in 7th century AD by the Pala kings of Bengal. The present temple was restored in 1883 by Sir Alexander Cunningham along with J. D. Beglar and Dr. Rajendralal Mitra. The temple which lies on a high and broad plinth, has a soaring 54 meters high pyramidal spire with a square cross-section and is visible for miles around. The walls are carved with various aspects of Buddhism. The entrance of the temple has torana or an ornamental archway. The south side of the temple has a lotus pond. The sanctum sanctorum has an image of golden Buddha signifying the pose of enlightenment. A chamber at the top houses a figure of Mayadevi, Buddha's mother. An ancient stone railing surrounds the temple on three sides. The railing dates to 100 BC and is the oldest and the excavated evidence in Bodhagaya. The original 'Bodhi tree' or Pipal (Ficus religiosa) where Gautama Buddha meditated and attained enlightenment was said to have been destroyed by Ashoka. The tree was destroyed and replanted at least five times. The present tree behind the Mahabodhi temple, in the centre of the complex is believed to have grown from a sapling brought from the tree in Anuradhapura in Sri Lanka, which had been planted by Emperor Ashoka's son Mahendra in 3rd century BC. The pipal tree grows at the back of the temple, said to be a descendent of the one Buddha sat under for three days and nights in the sixth century BC, before finding the answers he sought under a full moon. The tree is surrounded by beautifully carved votive stupas and chaityas, form a canopy over the seven sacred shrines. Buddhists revere the holy Bodhi tree and even its leaves are worshipped by them. The 'Vajrasila' (a red stone slab) under the Bodhi tree marks the place where Gautama Buddha sat in meditation. 'Animeshlochana', the sacred spot where Buddha stood to gaze in gratitude at the Bodhi tree for a week after his enlightenment. Located on the north east side of the temple complex, a stupa is erected here to commemorate the event. Pilgrims from Tibet, Thai, Bhutan, Japan, China and Burma have built their own temples here. A 20 meters tall (80 feet) Buddha statue built in stone can be seen at the end of the road, beyond the Japanese temple. It was built by the Daijokyo Buddhist sect and unveiled in the presence of his holiness Dalai Lama on November 18 1989. All important Buddhist festivals are celebrated here especially Buddha Jayanti, held on a full moon in May each year. The festival celebrates Lord Buddha's birthday. The celebration begans with a procession from the 80-foot tall Buddha statue up to the Bodhi tree behind the temple. Hundreds of Buddhists, including members of the International Buddhist Council, take part in the procession. Other festivals in Bodhgaya include the annual Buddha Mahotsava, a three day celebration, The Kagyu Monlam Chenmo and Nyingma Monlam Chenmo prayer festivals for world peace are held around January-February every year. The Maha Kala puja is conducted at monasteries for several days before the new year, for purification and to remove obstacles. Timing: open from 5 a.m. until 9 p.m.; Fee : No entry fee., Camera Fee : Rs.20/-, Video camera : 300/-. Timing to enter meditation park : Sunrise to sunset. Entry Fee : Rs.20/- for visitors and Rs.25/- for meditators. Eventhough, the best time to visit this temple is between November and February, the temple attracts a large number of devotees during the time of Buddha Jayanti which is held in May.